This trilogy has been recommended to me countless times. It seems as though everyone has read it and absolutely loved it, which I took to be a sure sign that I would enjoy it immensely. Bubbling with anticipation, I went out and bought the entire trilogy with the plan to read them at the most optimal time: the peak of summer. 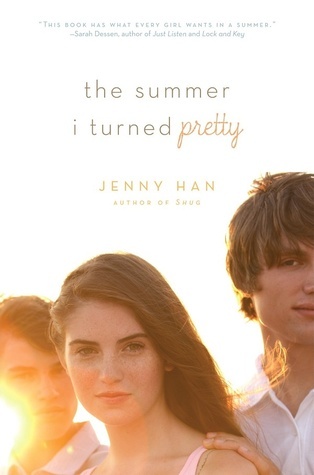 After all, these books have been described so very many times as the ultimate summer YA novels. So it was with soaring expectations that I plopped down on a sunny beach and cracked open The Summer I Turned Pretty. Sadly, I was not all that impressed. I mean, it certainly wasn’t terrible. The setting was the idyllic summer beach house of my dreams, complete with the promise of being able to return year after year. The writing itself flowed nicely and made the novel a quick, easy, fairly mindless read. The ending was satisfying, yet still open enough for there to be another book. But other than that, this novel fell sort of flat for me. I think my problem was that I didn’t really connect with any of the characters. Belly really annoyed me, despite my best efforts to like her. She was only fifteen years old in this book, yet she was incredibly cocky when it came to romance. She was also all over the place when it came to her maturity level. One minute she’s going to parties with older kids who are drinking alcohol, and then she suddenly decides to have an all-out temper tantrum. I just couldn’t take her constant emotional mood swings. I was also really disappointed with the two love interests, Conrad and Jeremiah. I expected them to be undeniably swoon-worthy, yet I didn’t find their personalities very attractive. At least Jeremiah was nice, but Conrad was a selfish jerk. And who did Belly love? Conrad, of course, because she has no common sense. Overall, this book was just meh. I didn’t hate it, but I didn’t think it was anything special, either. Hopefully the next book in this trilogy is an improvement! Would I recommend it to a friend? : It depends. Possibly for someone who was Belly’s age (around 15ish) because they might be able to relate to her more. Have you read this trilogy? What did you think of it? Let me know in the comments section below! Like the commenter above me, I’m sorry you didn’t enjoy this one much. I read the first book awhile ago too and I gave it 4/5 stars, but probably because I was oblivious to some of the faults in Belly’s characterization, as well as the lack of development in her love interests. From how you end your post it appears that you’re going to still read the next two books – is that correct?